Baypoint Top Floor Penthouse Luxury Condo Gulf/BayViews/Pool Spa Steps To Beach! 6th Floor Condo, 2 Bedrooms + Other Description 2 Baths, Great Views!! Gorgeous Place in a Perfect Location!! Naples beach tropical paradise is considered by many to be the crown jewel of Southwest Florida. Located on the Gulf Of Mexico, it offers sun-drenched days, miles of white sugar sandy beaches, warm calm breezes, warm sunrise, dazzling sunsets and moon rise all from this 6th floor unit! Enjoy the pristine beaches of the Platinum Coast, Vanderbilt Beach and Delnor Wiggins Beach. The condo is surrounded by bay water, channel and the Mexico from the lanai and the front balcony!! Many new updates in 2018 with new water heater, new AC, bathroom updates and new area rugs along with some new decor. Take in some of the beauty of historic downtown Naples, or take a self-guided tour around nearby Marco Island, Bonita Beach, Fort Myers Beach & Sanibel/Captivia Island. Enjoy water sports or lounging at the beach. Naples is well known for its fine dining, shopping, art museums, theaters, and many world class golf facilities. 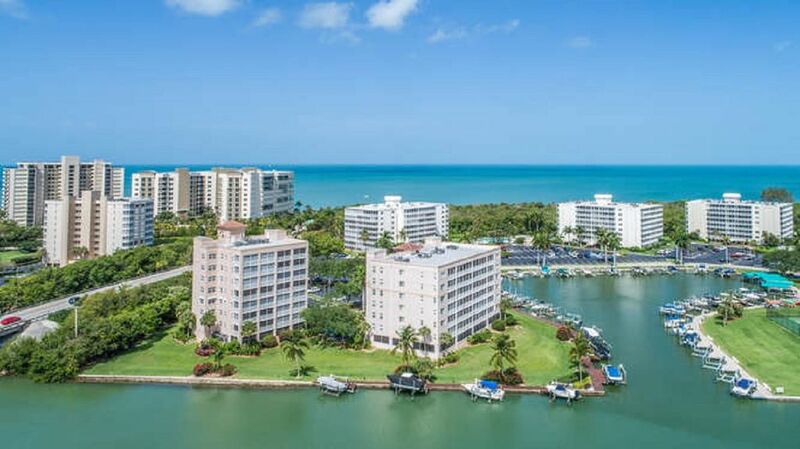 What could be more enjoyable than being able to relax in a comfortable, well-equipped luxurious top floor two bedroom and two full bathroom rental condominium with DIRECT WATER VIEWS OF THE BAY AND GULF! The master king bedroom has it's own access to lanai, walk-in closet, ceiling fan, flat screen TV, DVD player, wood floors and breath taking views of the water!. The master bathroom has tile glass enclosed shower with granite double sinks, tile floors with plenty of storage. The two twin bedroom which can be converted into a king has a direct view of the gulf along with flat screen TV, DVD player, ceiling fan and new wood floors. The second full bathroom has tile glass enclosed tub/shower combo, tile floors and granite counter top with single sink. The fully stocked kitchen has granite counter tops and stainless steel appliances, island style seating with bar stools. The kitchen eating area for four with direct gulf and bay views!! Open concept of the condo has a dining room with seating for six and living room with tile floors, leather sectional couch, flat screen TV, DVD player and views from every room. The walk-in laundry room offer new washer/dryer, iron and ironing board. The screen lanai is located off the master bedroom and the living room with amazing direct views of the water. Enjoy your coffee or favorite drink while watching the dolphins, sunrises, sunsets and boats as they travel thru the channel. The lanai offers table and chairs for four and outdoor seating area with coffee table for your relaxation and enjoyment. This top floor Baypoint condo unit features wonderful VIEWS of the inter coastal waterway, bay channel and Gulf Of Mexico from the lanai and front balcony. The white sandy beach is located a few short steps away! The entrance to the beach has restrooms showers, bike racks and water fountain. Condo has assigned parking space in garage along with outdoor parking in the lot. The complex is gated along with code entry into the lobby of the building. Stairwells, elevator and trash chutes are located off the front balcony of the condo corridor. Complex has large heated pool and in- ground jacuzzi overlooking the lagoon. Pool area has tables, chairs and chase loungers along with restrooms and gas grills. Take a stroll on the dock walkway along the bay channel or grab a book, favorite beverage or fishing pole and enjoy the benches along the beautiful tropical landscape property. The condo is fully stocked for all your rental needs. Hair Dryer, Beach Chairs, Coolers, Beach & Pool Toys, Wake Boards, Beach Towels, Beach Umbrella Supplied!! Enjoy outdoor activities, rent a boat for a day, grab a board and enjoy the beautiful blue crystal waters, kayak,paddle board, canoe, lazy day at the beach, dip in the pool, take a run on a wave runner, bike ride, lunch on the beach, 18 hole golf game and spectacular sunsets this is your condo. Myself and family have own condos in the area for years. We take pride in the units, housekeeping and the updates to the units. Master Bathroom: Granite Double Sinks, Walk-In Shower with Glass Doors. Walk-In Closet and views of the bay waters. Storage Closet Full Bathroom: Granite Single Sink, Tub/Shower with glass shower door. Located on Bay Waters and beach is steps away!! Steps to the beach!!! Vanderbilt Beach with walkway and restrooms. Condo is located on the bay waters/channel with beautiful gulf views too! Bedding Sheets, Pillows and Blankets. Sectional Couch with Two Recliners, New 48" Flat Screen TV, DVD, Stereo, Ceiling Fan and sliding glass door to lanai. Direct Bay Views!! Fully Equipped with all your cooking needs. Disposal, stainless steel Blender, stainless steel dishwasher, stainless Steel Refrigator, stalinless steel trash can. Tile floor Small wet bar area with cabinets Fully equipped with extras!! Kitchen Table With Gulf Views seating of 4 and two bar stools. Beautiful Landscaping with Benches for fishing, reading or relaxing!! Open Balcony/front entry of condo Front door/screen door/Gulf Views! Table and four chairs. Seating area with two chairs, love seat and table. Top Floor Unit, Ceiling fans , new tile floors, wood Flooring in bedrooms, granite thru out the condo, beautiful deco, fishing/cleaning area located by the docks Private Docks/Walkways on the Bay, Seat benches under palm trees to enjoy Manattee/Dolphin watching/fishing or read a book while relaxing. Gate Community, steps to the beach, restaurants, shopping, championship golf courses, water sports, and night life!! The property was great, clean, neat. Location was perfect - just across from the beach. The owner, Maria, was super helpful. She informed us in advance about the noise from construction nearby and offered larger property nearby for the same price. This is very unusual for VRBO business model and was very appreciated by entire family. We will definitely consider this property for next vacations. I would strongly recommend it to anybody. I can’t say enough good things about this rental! The location was absolutely perfect, with a quick simple walk to the beach. The condo itself was very ideal, and accommodating for any need we had. I especially enjoyed the view from the lanai. This condo was everything it was described to be and more. The owner was so easy to deal with and very quick to respond to any questions we had. I can’t wait to come back to Naples and will definitely be booking this condo again in the future! We had a great time here! The location was perfect as we could easily walk to the beach with our 8 month old twins. The pool was right outside and was beautiful as well and the parking was very convenient. It was great to have sand toys and a beach umbrella for the kids as well. The views from the condo were beautiful and we spent a lot of time on the lanai. The master suite was fabulous and the setup was perfect for us. It was beautifully decorated as well. We would love to stay here again! Stayed in May. This condo is clean and well stocked. It’s at a great location right next to the beach. It has a beautiful view of the inlet with a nice balcony to sit back and enjoy it. Maria was very easy to deal with. Just wanted to concur with other reviewers that gave this condo 5 stars. We've stayed in a number of condos in Florida and I'd rank this one at the top. We especially enjoyed the patio view of the inlet bay and marina with boats, kayaks, paddleboards, birds coming and going. Nice easy walk to the beach with foot baths and restrooms. Maria was very responsive to all our needs. Please email for current rates and specials Email for Holiday, Spring & Fall Break Weeks All Inclusive Prices!!! !